I’ve made kootu with a couple of different vegetables depending on what I have available. Most members of the gourd family- bottle gourd, chayote (chow-chow) to name a couple- are excellent choices for a kootu. This is a very simple and tasty kootu that I often make with radishes. Cook the radish pieces along with a few curry leaves, salt and turmeric powder in some water on medium heat till the pieces turn soft. Add the ground paste of coconut, cumin and red chillies to this and continue cooking for another 3-4 minutes. Now add the cooked toor dal, mix and allow the mixture to come to a boil. Continue cooking for 2-3 minutes on medium heat. Heat oil in a pan and add the ingredients for the seasoning. Add to the kootu and mix. Serve with steaming hot rice. TBC, That looks sooo yum! 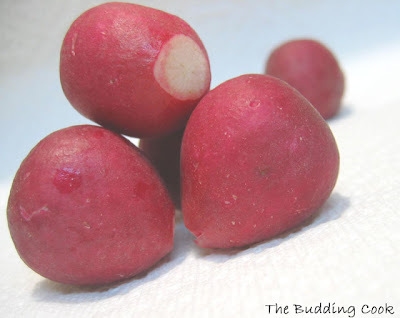 I like radishes and I am definitely adding this as a must try :o) have a fun weekend! Tbc, The kootu looks delicious. I have used daikon radish in sambars, but never before in kootus. This is a great idea, and I love the use of the little radishes. I have not tried with radish... will try definetly. Unlike me,J dislikes radishes and I always think of ways to add them in our menu. This is a very nice dish, thanks for sharing. I have never made anything like this with radish. The orange yoghurt bread looks too good ...Love this sambhar too..Just need a plate of hot rice eh!! Are wah ! this is such a wonderful idea to cook radish with. I liked it. I am glad that you tried my "Ghaaroda recipe " and liked it . thanks for leaving a comment to let me know that. Hugs to you :) . What a great blend of flavours. Now that spring is finally here, I'll be cooking with more radish. I will for sure have to try this. They make a good thoran(stir-fry) too. Happy Cook- ooh, now that's something I've never done. What's it like? Swati- glad u like the orange bread. Do let me know how you like it if you end up making it. i am not fond of radish but the kootu looks good, so it is worth giving a try !! I love radishes, but they are somewhat underused here. Generally we don't cook them but eat them raw in salads, or just peeled and sprinkled with salt. I am going to try this, it sounds delicious! This looks really great.Have to try this out. Vegeyum- I did not start cooking with 'em until a couple of months ago. It's great in salads. I've added them in potato salads and they add a nice crunch. This looks wonderful because I have never had it cooked! 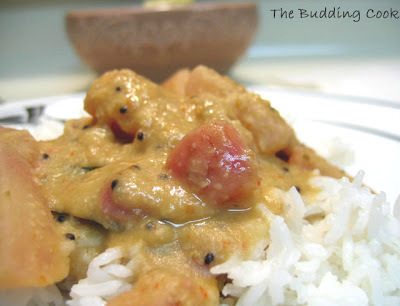 Cris- This dish(Kootu) is very common in South India. It is usually served with some rice. This is lovely! there is never too many receipes for red radish out there. They re always in season here, in Sweden and I ussually wat them raw in salads only. Zlamushka- I have used them raw in potato salads but that's about it. I lovethe pretty pink color! Meg- it is very nice of you to stop by.Thank you. You are one inspiring and courageous woman!